1 of 2 In a heavy-bottom small saucepan, whisk eggs, sugar, rum flavoring and both juices. Cook over medium heat, whisking constantly, just until boiling and mixture is thickened, about 10 minutes (mixture should register 160 F on instant-read thermometer). Strain lemon-lime curd into bowl; cover surface with plastic wrap; refrigerate 2 hours or until chilled. Can be made a day ahead. 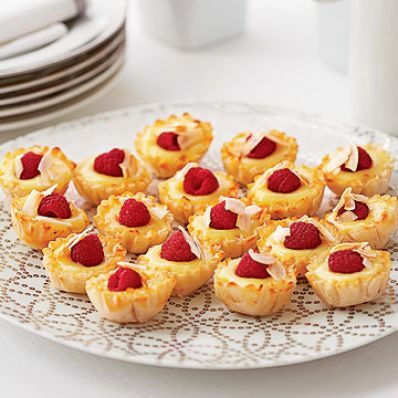 2 of 2 To serve, spoon 1-1/2 teaspoons curd into each phyllo cup; top with a raspberry and a pinch of coconut. Serve immediately or refrigerate up to 4 hours. Per Serving: 1 g pro., 44 kcal cal., 1 g Fat, total, 7 g carb., 0 g fiber, 0 g sat. fat, 15 mg sodium, 14 mg chol.